All mobile workers can use any smartphone/tablet to have their jobs sent to them. Long gone are the days where you all have to be in the office for 8 am and your jobs will be given to you on paper. Using our App, your jobs and appointments are sent directly to you. This enables you to go straight to your job, and complete it with all the information you require in your hand. The progress of all jobs is managed and tracked by the admin system in real time. This allows making time-critical decisions a lot more easily. All travel and job times are tracked. Expenses can be entered to give you the true cost of jobs. With the ability to take photos, see attachments and fill out forms on the go, using Eworks Manager makes writing out all that paperwork disappear. All jobs sheets can be signed off from the App, helping you get the confirmation you require from customer or operatives. Finding your job site address is also easy, with built-in maps and directions. We appreciate that security is a key factor when using subcontractors and external personnel, so having built-in security levels that allow mobile users to manage their jobs based on what you say they can do. 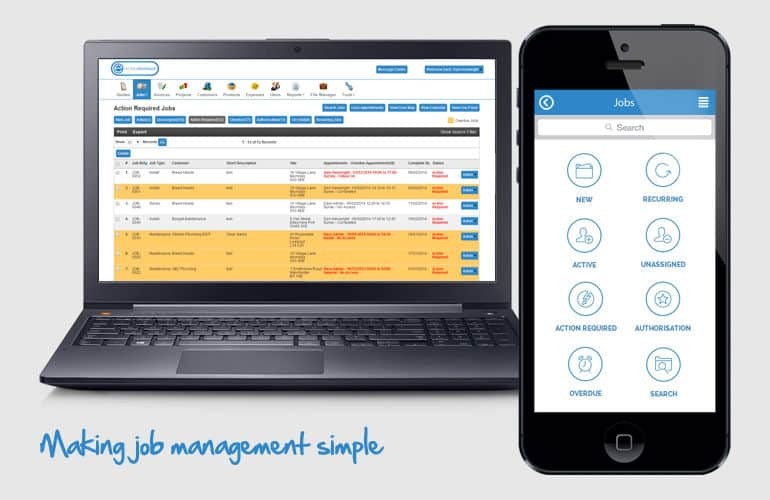 Eworks Manager is built for ease of use and flexibility, making us the solution for your Job Management Software.